Meet the RGBW LED Controller. Again. This is version 3.1 and has new features and firmware! 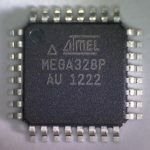 It is a LED controller that features an embedded ATmega328 with an Arduino bootloader for easy programming, 4 channel LED control with dimming, 5 or 12 volt output, IR receiver, XBee Adapter header, RS-232 or TTL serial I/O, 2 push buttons, 13 pin extensions for all unused pins (6 analog and 7 digital), power and channel LED indicators, and dual power input options. 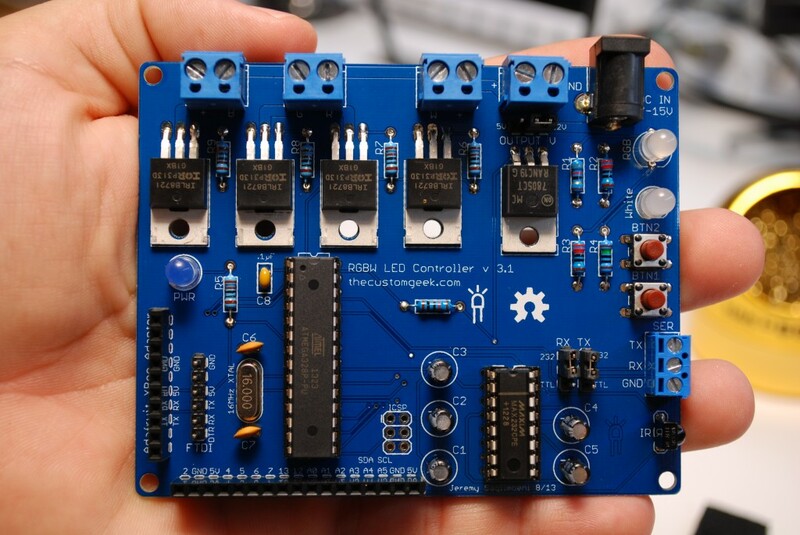 You can control 5 or 12 volt LED’s via serial with adjustments to the level of any channel with ramping to the desired level, rate of ramping, color cycle start and stop, rate of color cycle, length of stay on each color during cycle. Fans and motors can also be driven with ease. Be sure and also visit the complete assembly tutorial! Power supplies, RGB and white LED strips, and XBee’s and XBee adapters are available at Adafruit! I now have FTDI Adapters in the store! I now have an updated downloadable PDF manual with pictures! 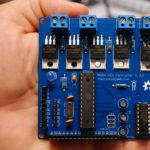 Remember, this is not a shield, it works standalone, without an Arduino!